I've been in bed for most of my Sunday so far (the best way to spend a Sunday) watching some of my favourite Halloween/witch themed movies. Hocus Pocus and Bedknobs and Broomsticks have been on so far then I'm hoping to move on to the really scary stuff when it gets dark and we hopefully have the super storm that has been promised tonight. I'm missing out on fancy dress party fun this year because I'm going for a weekend away but it's one of my favourite times of year and I still want to celebrate. I will be indulging in all things spooky and it's a good excuse to get some sweet treats in right? The kitsch personalised necklace comes from Heidi Seeker who also stock some other cute vampire and skull themed glittery Halloween treats which are a perfect way to subtly celebrate All Hallows' eve. 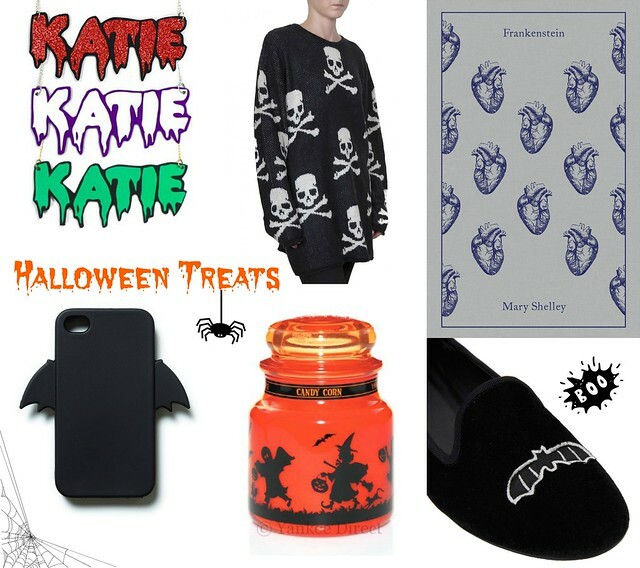 If you head over to the Original Attire Facebook page you can be in with the chance to win a £100 voucher to spend on the Heart by Nana Judy range which is where the skull jumper above is from. I will be travelling up to Birmingham on Halloween to watch Suede so I will be getting a copy of Frankenstein for free to read on my Kindle to pass the time on the journey and get into the spirit of things. Many books, especially classics like Frankenstein, are available under public domain licensing and have been converted into e-books for your reading pleasure. Have a look on Project Gutenburg for free titles. You can also buy the rather lovely hard copy in the picture above from the Clothbound Classics range. If you want to join in with some Halloween fun but aren't a fan of dressing up Zara and Forever 21 have some great bat themed accessories. We love to decorate the house here at Chez Southgate, we carve pumpkins and my brother gets his impressive Nightmare Before Christmas collection down from the attic. This year we treated ourselves to Witches Brew and Candy Corn Yankee candles. I love these cute slipper style shoes from ASOS, 16 year old goth me would have been obsessed with them too. Very Beetlejuice. I hope you have a lovely Halloween, if you went to a party this weekend leave me some links to your fancy dress costumes as I would love to check them out. Loving all the Breaking Bad themed ones this year.